Read these African safari reviews from like-minded nature travelers who have been to Kenya on non-package safaris holidays that combine soft game viewing walks, birding, photography, responsible wildlife viewing way from mass tourism. Learn the sheer freedom of not being cooped up in a safari bus during your vacation in Kenya + you can do this without breaking the bank! The African safari reviews below are from real clients who traveled with Ontdek Kenya and they give you a first hand safari experience of what happens if you go behind the tourist circuit on a slowed down itinerary that has quality time devoted for wildlife viewing with competent naturalist guides - not just someone who can point at the "Big 5". Remember you owe yourself to get the best possible nature travel and these trip reports will help you to make an informed decision. Read the safari reviews, ask questions and contact Ontdek Kenya Safaris for planning your nature safari in Kenya. If you've traveled with Ontdek Kenya, feel free to contact us to post your African safari reviews in this page. Omdat ik midden april in Nairobi moest zijn, wilde ik graag ook een mooie vogelsafari maken in Kenia. 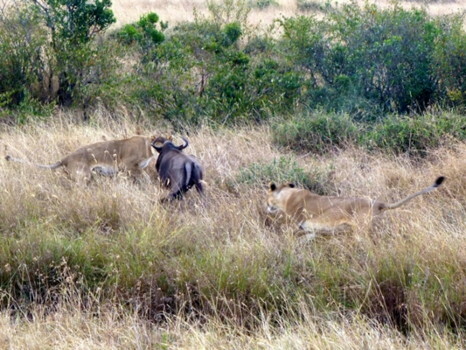 Via internet kwam ik in contact met "Ontdek Kenia" van Peter Huysman en waagde ik de sprong om mij voor deze safari vast te leggen. Daar heb ik geen spijt van gekregen, integendeel. Het was prettig om vóór de reis over bepaalde zaken te kunnen overleggen. In Nairobi werd ik door mijn 'driver' Mungai opgehaald voor de eerste bestemming (Aberdare Country Club). Daar startte de grote rijkdom van Kenia wat betreft vogels en zoogdieren. Dat hieldt niet op in de volgende grandiose bestemmingen: Samburu NP, Aberdare NP (de Ark), de meren van Naivasha en Crater, met als bekroning het Mara Masai NP met onvergetelijke landschappen. Ook onderweg hebben we veel gezien. Mungai was een uiterst plezierige metgezel en een onvermoeibare vogelaar. Mede dankzij zijn spotter talent heb ik ruim 225 verschillende vogelsoorten gefotografeerd. Al vogelend kwamen we alle grote katten (waaronder de zeer schuwe luipaard) en tientallen andere zoogdieren tegen, inclusief de big 5. De maaltijden en overnachtingen waren uitstekend. Mungai gaf je het gevoel als een koning verzorgd te worden. WiFi in de jeep was ook super. Ik zie uit naar nieuwe safari's in Kenia. I just wanted to say thank you for putting together and organising such a great itinerary and trip for us. Each location had something different which made it worth the visit. I appreciated that we weren't stuck in vehicles all of the time and had the opportunity to get out and walk in places like Hell's Gate. On the other hand, I thought that the itinerary was well balanced, particularly considering the age range of the students, and ensured that after a few tiring days of walking, they had the opportunity to relax a little with the drive around Lake Nakuru and enjoying the swimming pool at Tumaini Conference Centre. Ending in Maasai Mara was a definite highlight for us all. I've been on several safaris in South Africa and also in Uganda and Maasai Mara was by far the most impressive park that I have seen. The scenery and quantity of wildlife (3 different leopards in 3 days!) was amazing! On top of everything, Mungai and Jackson were fantastic. They were enthusiastic and very informative. There was barely a question that they were unable to answer. They were flexible and understanding on the few occasions that a student was unwell and adjustments to the day had to be made. They were also very professional - arriving on time every day, driving carefully and regularly reminding the students to wear their seat belts. As well as all of this they were very well liked by the students and it was really sad for them to say goodbye at the airport. I definitely intend to do another trip to Kenya with the school (more likely not next Easter but the following to allow for a new batch of students to move up through the school) and will make sure that Ontdek is added to our listed of trusted external providers. Many thanks again for all of your work and best of luck with everything. Please feel free to use me as a reference if needed by any future school groups. Its been over a month since we finished the Safari with you. The pleasant memories of hiking and driving through the game preserves still linger. We both had experiences that we will never forget. Thank you for making the tour very interesting an satisfying. Our guide/driver, Mungai, was exceptional. You are very fortunate to have someone with his abilities on your staff. We thoroughly enjoyed his companionship, knowledge, and willingness to make our trip very special. The choice of itinerary and lodging was excellent. Even the travel days were interesting. We know from the news that West Africa is having some severe health problems. I'm sorry that this has probably unfairly impacted the tourist activities in Kenya. Hopefully the problems will be resolved in a short period of time. We will enthusiastically recommend your operation to our friends. First, I cannot imagine a better guide than Mungai. He was always right on top of everything, exceedingly knowledgeable, amazing in his ability to quickly to spot the most camouflaged creatures and birds, wonderfully kind, interesting, funny, sensitive -- in short I cannot say enough good about him! And he is an absolutely brilliant driver. If we have the opportunity to return, which we would love to do, we will certainly request him again. We (myself, wife and daughter age 14), in conjunction with 2 relatives from the US, booked with Ontdek after much research had been conducted by the US couple. They were able to start sooner than we were so we ended up each taking 12 days, with a week at Naivasha, Nakuru and the Masai Mara common to both of us. Peter was unfailingly helpful at the planning stage, suggesting destinations and tactfully pointing out where our aspirations were too ambitious given the time scale (Kakamega forest). Our interest in birds as well as animals (and the country itself, of course) was one of the factors that led us to choose Ontdek. I find it hard to believe that we could have found a better driver/guide than Mungai. His knowledge of birds and animals was seemingly bottomless and he was endlessly patient with our questions about the sights that we encountered, both natural and cultural - a really lovely man. All of the places we stayed were of an extremely high quality. Highlights were the Oloshaiki camp in the Masai Mara, The Ark in the Aberdare National Park, and (a totally different experience) the Kiambethu Tea Farm, where Fiona was a charming host, but all the accommodations were excellent, and I feel guilty not listing them all. If (or, more likely, when) we go back to Kenya then we would certainly use Ontdek without any hesitation. PS I have given 5 stars in all the rating categories below, including that for the vehicle's quality and cleanliness, because that's what I think they deserved. Bear in mind that Africa is dusty and/or muddy, so that the vehicles get dirty during each day (but each morning it arrived freshly cleaned), also it's a Land Cruiser (as almost all the Safari vans are there), not a Lexus, but absolutely fit for purpose (and we saw one 'urban 4x4' totally stuck on a muddy forest road - I imagine the luxurious internal carpets might not have been much consolation for the passengers at that point). Tom and Ev traveled with Ontdek from February 16 through 28, 2013. They booked their tour with a partner tour operator in the UK. First, I would like to say that we had the most marvelous experience with Ontdek in Kenya. We thoroughly enjoyed our treks, the wildlife (animal and bird), the accommodation, but mostly the people. Mungai was a pleasure to be with, and we feel we made a friend. He is extremely articulate and always willing to help foreigners understand what it is like to be Kenyan. And thank you and Anne for your organizational skills, and making sure we were OK. It was fun to meet your family on the road to Hell's Gate. Your children are beautiful. Nancy and I also enjoyed our safari in TZ - the Serengeti and Ngorogoro Crater in particular. Every day we spent in Kenya and TZ was different and special. Our son Mike arrived a day ahead of the start of our trek up Kili. We experienced -25C and a blizzard on the way up - not for the faint of heart! Once again, many thanks. Let me know if I can provide any feedback to other travelers or websites. This is my second attempt to supply you with our thoughts and considerations, regarding our recent holiday. My computer may have sent half a letter to you! Sangare tented camp. Wonderful. Just eight of us, breakfasting outdoors as we spotted birds, what a way to start the day! Then to the Ark and all those noisy people! I found the Ark disappointing, too many people and not a lot to observe. I suppose if you have a phobia about walking anywhere you probably loved it. Time spent at Sunbird and Sawela Lodges was time well spent. Very enjoyable, lots of birds and animals to photograph. Wherever we stayed we were fed extremely well, too well actually, we are now on strict diets, no more cooked lunches and cooked dinners. We now operate on an either or policy, definitely not both. And so the highlight of our holiday, time spent in the Mara. What can I say. Fantastic! Amazing! Fabulous! Wonderful! A magnificent experience! I have exhausted my superlatives. And so to the main man, Elijah. He described himself as just a driver! He could certainly drive, and spot birds, and mammals, and tell us all about them and their habits, a mine of information. A wonderful companion, who shared our jokes and humor. He was was determined to find leopard for us to photograph. And when word came on the "old grape vine" (yet another colloquialism,) we were off. Sadly, leopard was no where to be seen. The sighting of a tortoise on our journey back to camp was but a poor substitute. In conclusion, a wonderful holiday. Thank you. I wish the both of you every success in your new business venture. Review of our birding safari with Ontdek. Fran and I have traveled extensively and this was our first safari, 12 days in July of this year with Ontdek. From start to finish, this trip was all we could have wished for. Michael and Mungai were exceptional birders and representatives of Kenya and Ontdek. Our total of 325+ birds and innumerable animals was almost secondary to the overall satisfaction of a trip that covered all aspects of the country and its dedication to preservation of its way of life. Anne and Peter should be proud of the way their company's employees have represented them. The lodges were 1st class and the birding was great. After the Sleeping Warrior Camp, our favorite, we were not impressed with the type of birding available at the Lake Baringo Country Club -- till Michael showed us more birds in 2 hours than we could imagine. We would book, and we plan to again, and recommend Ontdek with no reservations. It was a trip of a lifetime. Thank you Anne and Peter. We have been saving up and waiting to visit Kenya for many years. 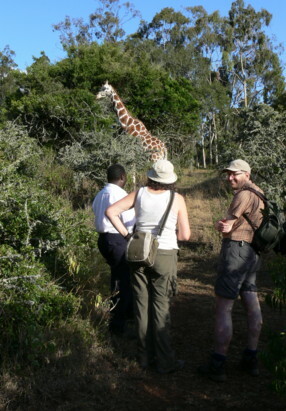 We chose this walking safari because it seemed to offer the experiences of Kenya without too many travelling miles between sites and a chance to walk in some safe areas with the animals. We booked a 10 day Senior Tour walking safari with Ontdek in Feb ’10 and it was fantastic. From initial contact through to transfer to Nairobi airport for our return home, everything worked out great. Want to see a lion as close as your garage? A monkey frolicking on the drainpipe of the park-keeper's hut? A rhino teasing a waterbuck at the midnight waterhole? 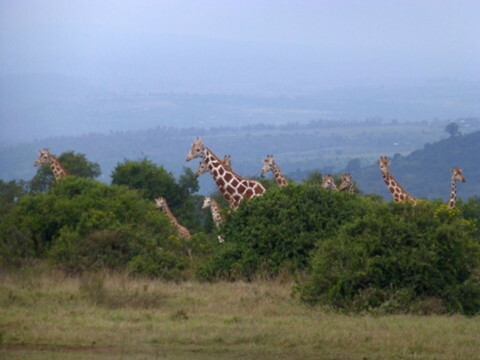 These are just some of the stunning opportunities a spell with Ontdek Kenya will bring you – in an indeed magical way. Sorry it took so long, but I am finally getting my feedback to you. All the places we stayed at were fantastic... guess I was expecting more rustic dwellings and was delightedly surprised. I wasn’t that fond of Treetops, (too many people) though it was an interesting experience! Looking back, I would have preferred to have stayed another night at the Sangare tented camp instead of a Tree hotel. Sangare had a much more personal experience. I would like to thank you enormously for our wonderful holiday of a lifetime last week. Everything went like clockwork from our first exchange of e-mails to the last minute changes that we requested and you were able to accommodate. Well, we made it home after that crazy long day and a half of flying! We took Peter's advice and ate at the Simba restaurant at the Airport and enjoyed a long meal. Please thank him for the suggestion. We were able to look at some of our photos on our cameras and we were reminiscing about the trip. What a wonderful trip! I just returned from a trip of a lifetime with Ontdek tours in Kenya. We experienced walking safaris with animals and birds, wildlife safaris in the Masai Mara, Amboseli, small conservatories with high concentrations of rhinos, and meeting the Kenyan people. Every day was a new adventure and we learned and saw something new. From fish eagles to hippos in the swamp or rivers, lions and the baboons. The accommodations and food was top notch and Anne Huysman does an outstanding job arranging the perfect trip for your own personal interests. You have your own driver and guide who is very knowledgeable about the area. 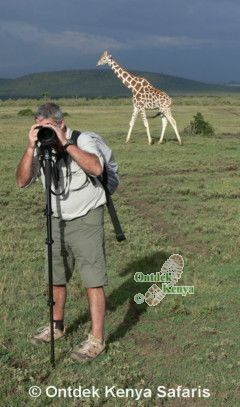 We did a private safari with Ontdek in March 2009, visiting Amboseli and Tsavo West as well as stays in Mombasa and Nairobi. They are a very professional, friendly and competent company. Some companies we approached quickly grew impatient or disinterested when we wanted to discuss the best itinerary, but Ontdek were endlessly patient and helpful in refining our plans. Every aspect of our trip was organized well and the whole trip went without a hitch, even when our incoming flight was delayed by a day and they had to adjust plans at the last moment. Our driver and guide, Elijah, was superb. He spoke good English, had unbelievable spotting skills and was a friendly and humorous traveling companion. We will definitely use Ontdek again if we return to Kenya and I thoroughly recommend them without hesitation. I traveled with Ontdek in February for 10 days on a safari itinerary to Naivasha, Nakuru, Elementaita and of course the Masai Mara. Very personal service, Elijah was great as was Peter, the owner. His wife Anne made all the arrangements and everything went really well. Nothing was too much trouble for them. I would undoubtedly use Ontdek again if visiting Kenya and unreservedly recommend them. Sorry for the passed time since your question, but it is the first time I come here. Also sorry for my bad English speaking. Well, we did a safari with Ontdek Kenya in Jan - Feb 2009. Out of our heart, it was fantastic! The personal approach, the conversation possibilities to speak about the travel with e-mail and arrange everything to our expectations, and with their knowledge. The organization was absolutely perfect! We never did enjoy a travel more than that. The accompanying guide and driver did a fabulous job. Everywhere we came, we never were in a crowd of vehicles, and the lodges where totally in the range we asked fore. While we where traveling with 4 in 1 4X4 (on our own demand), we saw different other companies traveling in large groups of different vehicles where they were with about 12 persons in one 4X4 vehicle - or large buses - really pressed together - making it a worthless experience for the most of them. The personal approach and follow up was impressive. My advice is for sure very positive. Just go for it !! This safari exceeded all our expectations, having the chance to actually walk in some of the nature reserves gave all the group a chance to experience a close to nature feel. with the final 3 days doing game drives in The Masai Mara to see all the big 5 was the icing on the cake. The guides Peter, Michael and Elijah could not have been more helpful and their knowledge of both birds and game was excellent. The accommodation was good as was the food, be that on a couple of occasions number of guests at the lodges was low probably due to the past troubles in Kenya. All the places we visited the local residents were most welcoming and friendly. I highly recommend this safari itinerary, the organization and care of the guests from the time we landed at Nairobi to the time we left Kenya will stay in our memories forever. We spent this safari in a group of 9 guests with 2 local drivers and 1 local guide throughout. In addition there were local guides at most locations. We had a first class trip, well organized by cheerful, helpful staff. Through their expertise we saw all the big 5 and much more besides particularly birds. The accommodation was good and the combination of game walks and drives gave an excellent insight into wildlife in Kenya. The meeting with the local population particularly the Masai was both interesting and rewarding. They are a fine people. Overall a wonderful experience that I would recommend to anyone with a wish to get close to Kenyan rural life.